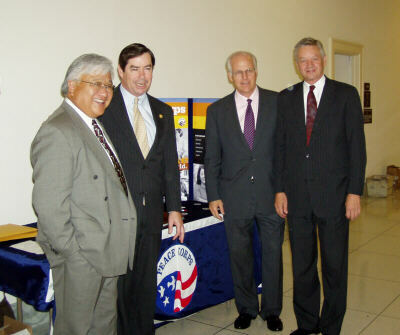 Rep. Petri (right) joined with RPCV Congressmen Rep. Mike Honda, Rep. Jim Walsh, and Rep. Chris Shays for a Peace Corps recruitment meeting with young congressional staffers. Rep. Petri served as a Peace Corps volunteer in Somalia. Retired Somali general may stay in U.S.
A retired Somali general whose pro-democracy efforts cost him 12 years in prison and whom one former U.S. ambassador calls "the greatest living Somali" is now living in Minnesota but has been turned down for permission to remain in the United States. Some former diplomats who consider Gen. Mohamed Abshir Musse a valuable U.S. ally are working to get him that permission. Abshir, 76, expressed no anger over his situation. "I expect nothing but good from my American friends," he said, and believes they are doing all they can for him, including a special bill in Congress that would enable him to remain here. "Gen. Abshir has done more for the United States and more for stability in his own country than any other Somali," said retired diplomat Peter Bridges, who was U.S. ambassador to Somalia in the mid-1980s. Bridges, two other one-time U.S. ambassadors to Somalia and three other former U.S. officials responsible for American relations with that region signed a letter to Secretary of State Colin Powell asking that the State Department support the bill. The letter said Abshir's assistance to U.S. military personnel during the ill-fated 1992-95 "Operation Restore Hope" had saved many American lives. The U.S. government has not literally threatened to deport Abshir, who lives in the Minneapolis suburb of Eden Prairie. His legal status is murky. He has not been granted asylum, but since his arrival in 2001, he has had permission to care for his 27-year-old son, who has multiple sclerosis. That was a temporary status, subject to periodic renewal. The last time he sought renewal, the Immigration and Naturalization Service (INS) asked him for a visa and a passport and a ticket out of the United States to prove that he had plans to leave. Abshir told the INS about the bill but received notice that his application was denied and that no further appeal was possible. Somalia, which has been declared a potential haven for terrorists, is among the countries under special scrutiny since Sept. 11. Martin Ganzglass, a lawyer in Washington, said a male from such a country who lacks firm legal status must consider himself susceptible to arrest and deportation proceedings. But the INS is barred by court orders from deporting anyone to Somalia on the grounds that it has no government able to receive deportees. Ganzglass first worked with Abshir in the 1960s when Abshir was Somalia's top policeman and Ganzglass was a Peace Corps worker assigned to give legal advice to the fledgling Somali republic. Tim Counts, a spokesman for the Bureau of Immigration and Customs Enforcement, said the INS is "aware of the situation and we are looking into it." Abshir left Somalia in 1998 for Djibouti, then Saudi Arabia, then Minnesota, believed to be home to the largest number of Somali-Americans. For two years, he has lived here with his wife and three of his seven children. They are all supported by their married daughter and son-in-law, who is a U.S. citizen. Abshir's wife, Mariam Musse Gul, said their ailing son no longer has access to medical care. She and the children may also face problems when their visas expire in a few months. All of them are covered by the bill. It is sponsored by U.S. Rep. Thomas Petri, R-Wis., who was a Peace Corps worker in Somalia in the 1960s and knows Abshir from that time, according to Ganzglass.